A few years ago - on a shuttle bus back from the Six Foot Track marathon - someone told me about the Mount Solitary ultra (45k) event. The Six Foot Track marathon was my first run in the Blue Mountains, and while it was a nice run - it didn’t encapsulate the stunning scenary the Blue Mountains has to offer. Fast forward to 2017 and I had locked in the Mount Solitary run since the start of the year. Preparations were in order, with a good build up of training and a little airBNB accomodation booked. Sure enough - as the weekend rolled around on the Friday afternoon news came through that the organisers had to postpone due to inclement weather and National Parks advice. Tropical Cyclone Debbie had dropped enough rain far enough south to put the dampener on the event! Not to be put off - and with our accommodation already booked in I picked up David Longo and we hit the road to the Blue Mountains. After a relaxed run, soaking up the dramatic vistas, sheer cliffs and waterfalls around Wentworth Falls - we arranged to do a simple out and back on the UTA22 course. This was effectively the ‘back half’ of the Mount Solitary run, and a perfect opportunity to familiarise myself with the area and part of the course - most importantly it gave me a good sense of what a mongrel climbing out of Kedumba can be. Then roll forward 6 weeks to Sunday 4 June and the rescheduled event was on! Arriving 40 minutes before the start - with the orange glow of a beautful sunrise emerging - we navigated quickly to our mandatory gear check. I’d recently upgraded to the Anton Krupicka Ultimate Directions Mountain Vest - as my previous vest (UD Scott Jurek Ultra vest) was just a bit too tight when all mandatory gear was involved. This was a good choice - as the race director had informed us all that the ‘extra’ mandatory equipment would need to be carried - forcing thermal tops and pants into the pack. The organisers were super efficient - gear was checked, registration done and t-shirt handed out in no time. Soon we were huddled under the provided gas heaters - waiting for the welcome to country and the opportunity to start running out the nervous energy. In running the back half previously - I’d set a stretch goal of 6 hours, but a realistic goal of a sub 6:30 race. Either way - I was as always out to enjoy the day, manage my pace and nutrition, such that I felt good (enough) to the finish. The run starts with a small uphill, before the fast bombing run down into Kedumba valley. After 5k’s we were quickly at the turnoff to Mount Solitary and the start of some lovely flowing single trail. As we reached the river - I just managed the delicate walk over the fallen log to avoid an early soak in cold water - and quickly we were at the start of our first climb. I’d decided for my fueling to ditch my standard TailWind - in favour of a mixture of gels, electrolytes and some real food at the half way aid station. So as we slowed to a power hike up the hills leading towards the main col up Mt Solitary, and we ticked over to 45 minutes since the start - I ripped into my first Science in Sport isotonic gel. I kept to plan and every 45 minutes grabbed my apple or blackcurrant gel - which passed the test as they continued to be yummy right to the end of a long day out. 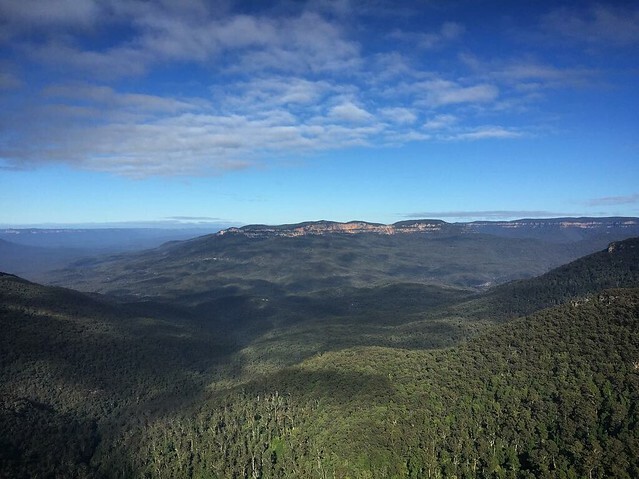 It was as we were coming up Mt Solitary that I kept seeing snippets of notifications arriving onto my watch about some event in the UK .. this was tainting the sense of disconnection and nature you get in a long run. But I had to ignore it as much as I could. Soon we were into a steep scramble up onto Mount Solitary. With a fabulous cloud inversion in the Megalong valley - it wasn’t until we hit the first ‘summit’ that we got above the cloud and could start to appreciate the hard work. Running along Mount Solitary was great fun - lovely single track, many false summits, awesome views, and enough twisting and turning to keep you on your toes and remember you had a long way to go yet! Luckily the organisers had marked the course with enough pink tape that only a few times I wondered if I’d taken the wrong twist and path. I couldn’t help myself but stop a couple of times to take a few photo’s of the views - absolutely stunning! Corker of a day out! 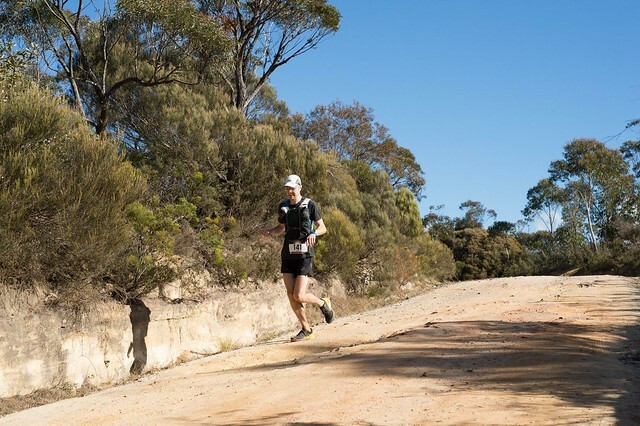 Running Mt Solitary ultra with 140 other legends. There are a few campsites up on Mount Solitarty - and a few campers that had their relaxed campsites turned into a thoroughfare of spritely and unencumbered trail runners. I had a good chat for a while with a local runner who like me was soaking up the stunning views and landscapes. Coming off Soltary was pretty straight forward - with some technical parts and requiring hands to safetly drop down larger drops. Once off the mountain we hit some lovely single trail through lush greenery , soft underfoot, that followed the contour of the valley. Running here was nice and fun - with more tourists emerging and needing to be negotiated around. I was tucked behind another Sydney runner who was keeping a nice pace, and led me through the landslide section, and on past the tourist laden Scenic world. That brought me to the start up Furber steps. I’d heard about how tough Furber steps were - and to be honest was expecting it to be more of a slog. The steps had step stairs, followed by little sections under cliffs, or more gradual steps. The three of us who had been tracking along since coming off Mount Solitary pushed up - passing a group of school kids who each wanted a high five and gave us encouragement. As we neared the top I saw David bombing down - on a cracking pace. At the aid station - I did a quick gear check and topped up my soft body flasks with more water and electrolytes - and then quickly checked my phone. Denise was wishing me well in a message - I had been worried she knew people involved in whatever the heck was happening in the UK. I grabbed out my stashed solid food - plain inari with soy sauce. I got a few comments as it’s not your usual runner food - but it is perfect - sweet and salty with carbs through the rice, and all held together nicely in the tofu packaging. I think I was in and out in 4 or 5 minutes - not the fastest transition. Heading down Furber steps the friendly encouragement from those on the way up was a nice little booster. Soon enough I was back on familiar territory - heading through Leura forest again on beautiful single trail. After a brief and unexpected gear check I kept a solid pace all the way through Leura Forest and down out onto the fire trail. After 30ks I was feeling stronger than I was when doing this part in my UTA22 course out and back 6 weeks earlier. Things were tracking well. I had no stomach issues, and the legs felt good. I was mostly running on my own - but had a good chat with a runner who I’d clocked as a nutter at the start as he was running in sandals! He was cruising along - apparantly with such a good technique that no pebbles landed under his feet - but a lot slower than me on the downhill, but able to chug away and pull away from me on the uphill slogs. I wasn’t looking forward to the climb out of Kedumba - and made sure I ran pretty strong to the final river crossing at Jamison river. Here was a manned water station - where I quickly refilled one of my flasks - and soon questioned my thinking with only about 650mls to see me rise up out of the valley over the next 7 or so k’s. I was still a bit scared from the last run out - where I was rationing water, dehhydrated and in struggle town. As I power hiked up some of the steep rises I could feel the legs getting more tired, but I was now starting to think of the finish and what time I really ought to aim for. 6:15 seemed possible, but 6 hours was out of the question. The rise out of Kedumba is unrelenting, steep and seemingly endless. I had been running with and talking to a nice lady for about 4 kms until her ability to run the more gradual ups put me to shame and she pulled away. The next runner that came up behind me gave me a virtual shove and I dug a bit deeper determined to runout the last 4 kms. I came over the rise and saw an event photographer - I was on the home stretch. Cowbells, and a small cheering crowd saw me beep over the line. 6:25. I can judge how spent I am by whether my legs can bend to allow me to untie my shoe laces and take my shoes off without cramping. Success! No cramps in the run, no stomach issues, came 37th overall under my 6:30 target. A great day out, with a small group of runners in a beautiful location. Definately an event I’d be happy to come back and try to improve upon.